Rumah Sakit Umum Daerah Dr Tjitrowardojo Purworejo - RSUD Dr Tjitrowardojo Purworejo is a well-established state-owned general hospital in the Province of Central Java, based in Purworejo. RSUD Dr Tjitrowardojo Purworejo is the Hospital Class B education. RSUD Dr Tjitrowardojo Purworejo is registered at Jl Jenderal Sudirman No 60 Doplang Purworejo. 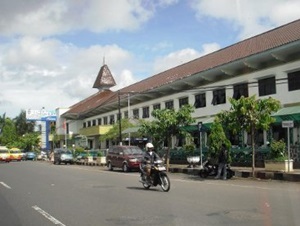 According to information found in the Hospital's website as cited by JobsCDC.com, RSUD Dr Tjitrowardojo Purworejo was first established in 1915 and initially registered as Zenden. In 1951, the Hospital renamed into Rumah Sakit Umum Purworejo and transformed to Rumah Sakit Umum Daerah Saras Husada Purworejo in 2005. The name of RSUD Dr Tjitrowardojo Purworejo officially launched in 2014. RSUD Dr Tjitrowardojo Purworejo now has 262 installed beds capacity. In line with its continued expansion program, RSUD RSUD Dr Tjitrowardojo Purworejo is pleased to announce the following vacancies for immediate recruitment. Perawat ICU/PICU/NICU : D3 Nursing + ICU/PICU/NICU certificate (20 positions available). Perawat Anesthesi : D4 Anesthesia / D3 Nursing + Anesthesia certificate (2 positions available). Perawat Bedah : D3 Nursing + Surgery Certificate (7 positions available). Petugas Teknik : D3 Electricity Engineering Power Lines (2 positions available). Petugas Produksi Makanan-Minuman : D3 Cullinary / Hospitality (3 positions available). Petugas Distribusi Makanan-Minuman : D3 Cullinary / Hospitality (3 positions available). JobsCDC.com now available on android device. Download now on Google Play here. Please be aware of recruitment fraud. The entire stage of this selection process is free of charge. RSUD Dr Tjitrowardojo Purworejo - D3, S1, S2 Non CPNS RSUD Purworejo May 2018 will never ask for fees or upfront payments for any purposes during the recruitment process such as transportation and accommodation.